Stock Picks Tata Investment Corp - A multibagger? A lot of investors have been pondering on Tata Investment Corp, an investment company that has significant shareholding in many Tata Cos and other bluechip companies. The company is trading at a significant discount to it's NAV. Now this is not a mutual fund and the NAV here refers to the per share value of the quoted and unquoted investments. The company trades at a PE multiple of 15 and has it's evenues have been growing by around 7% p.a. and the PAT has been growing at around .6% p.a. on a 3 year CAGR. The company gets its revenues from dividends and sale of it's investments. This is not what we look at in this company. The interesting part comes now. The company has holdings in diverse sectors apart from the Tata group. The company declares the NAV every quarter and for the quarter ended 31st December, 2016 the NAV per share is: 1340. As you can see in the above table, the company has Rs 55.09 Crores of paid up capital which corresponds to around 5.5 Crore shares. At an NAV of 1340, the market value of the holdings is Rs 7,370 Crores. The current market cap of the company itself is Rs 3,255.86 Crores (20th Feb, 2017). This translates to a discount of 55.97%. Now holding companies are known to trade at a discount. 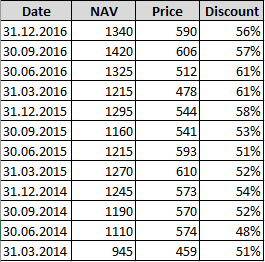 The above table gives you a 2.5 years analysis of the discount the stock historically trades at. Why does it trade at such a discount is tough question because we don't know what is in the mind of the investors. So should you invest in this company? If yes, then when? Consider this - The stock has given close to negligible returns over the last 10 years except the dividends. The NAV has grown from 740 in 31/Dec/11 to 1340 in 31/Dec/17 but in the same period the stock has moved from Rs 420 to 600. This means that the stock has underperformed the NAV growth by 50%. The onus is on you to decide if you see some value here and if you see some trigger in the future that can unlock this value. There is considerable margin of safety that we see here as per our calculations in which adjust the value of holdings between promoter and non promoter holdings and add the terminal value of dividends that the company receives from the Tata group. But does the stock find place in our long term portfolio at this point of time? Be a part of our Investment Advisory Services and get access to our solid research backed investment picks for your portfolio along with proper portfolio guidance and allocation details.